This craft project to make a cheerful girl’s diary is quite easy to make, when you use our free printable patterns for the diary cover and inside diary pages. Embellish the cover with pre-cut foamies or make your own flower shapes (we have a printable pattern for those, too)! If you prefer to make a journal or notebook, cut down lined or plain paper to fit inside the cover. 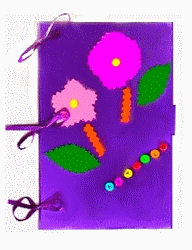 To make a girl’s diary, print and cut out all the patterns, including at least four of the two inside diary pages. To make a notebook or journal, print the cover pattern, the flower pattern (if using), and one sheet of the diary pages to cut out and use as a template for your own lined or blank paper. Trace around the cover pattern and flower patterns on desired craft foam colors and cut out. Cut the foam cover in half, where the center line is shown on the pattern, to make separate front and back pieces. Line up the cover, with the tabbed section on the front and one of the diary pages inside. Use the paper punch to make three equally spaced holes on the left-hand side. Stack the remaining inside pages, keeping them lined up neatly. Place the hole-punched diary page on top of these pages to show you where to make the remaining punch holes. Punch through all the pages. Line up the top cover, inside pages, and the back cover, then thread a length of ribbon or yarn through each of the holes and tie in a bow at the front. Glue on the flowers or other cover decorations. Hot glue a small square of velcro on the inside of the tabbed latch. Glue the matching piece of velcro to the back of the diary to keep it closed. If you don’t have velcro, you could cut off the tab completely, leaving the diary as an open book. Alternatively, you can punch a hole at the end of the tab, punch a matching hole in the back cover, and tie the diary closed with ribbon.